Garlic is a natural blood thinner. See more in this slideshow! Dating as far back as the days of the pharaohs, humankind has used garlic for health purposes. Indeed, the common garlic plant is one of the most ancient of all curative herbs. It has been credited with potent curative and preventative properties, and has long been prescribed by traditional healers as a remedy for conditions and diseases as disparate as dental plaque build-up to cancer. Today, it is a leading herbal remedy among alternative medical practitioners. As early as 510 BC, the Chinese recorded the medicinal benefits of garlic, which they called da suan. Over the centuries, they have used it to treat respiratory infections, intestinal conditions, parasitic infection, tumors, food poisoning and low blood pressure. Pliny the Elder (23 to 79 BC) recommended garlic for treating asthma, coughs and intestinal parasites. Ancient Sanskrit records reveal several Indian garlic remedies that were in use over 5,000 years ago. Garlic is used in Ayurvedic medicine for earaches, respiratory infections, colic and ulcers. Military surgeons in the Second World War used garlic poultices to help prevent and treat septic conditions that developed in soldiers' wounds. For centuries, the Amish have used garlic cloves to treat intestinal worms for themselves and their animals. Studies have also revealed that garlic serves as a mild anticoagulant, playing a significant role in preventing acute blood clots from forming. This helps improve blood circulation. Garlic also lowers levels of triglycerides that, together with cholesterol, tend to increase the risk of stroke and other cardiovascular conditions. Garlic has hypoglycemic properties: used regularly, it boosts the production of insulin in the body, which in turn lowers blood sugar levels. All in all, it has been determined that the increased use of garlic or garlic supplements can lower the chances of heart disease by up to 25 percent, and the incidence of stroke by up to 40 percent. From the findings, it is clear that garlic is an incredible protector of the heart. Regular use of garlic has also been found to boost the immune system, helping the body fight off infection. 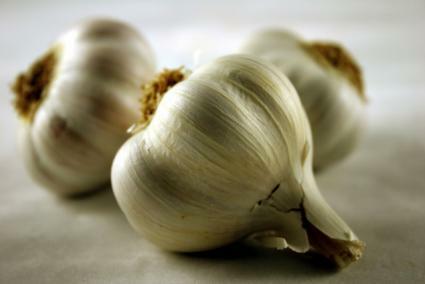 In the 19th century, garlic's antibacterial properties were confirmed during an outbreak of an infectious fever. While English priests caught the fever, their French counterparts, who ate garlic on a daily basis, did not.Garlic also has anticancer properties, helping the body defend against particular types of cancer, such as breast, skin, colon and stomach cancers. Garlic has been proven to be effective in defending against the common cold, the flu virus and herpes simplex (which causes cold sores). A recent study discovered that the risk of catching a cold was reduced by half among volunteers who took daily supplements of garlic. The volunteers who did catch a cold, made a speedier recovery than those who did not. Garlic's antimicrobial properties help fight bacterial, viral and fungal infections have long been acknowledged, even by Louis Pasteur, the great microbiologist. In fact, garlic earned the name "Russian penicillin" because of its widespread use as an antimicrobial remedy. An infusion of garlic can be used as a topical treatment that is used to clean and treat cuts, wounds, burns and minor injuries. This is also used as a soak for athlete's foot and a douche for yeast infections. Nutritionists have found that a single clove will boost your body's supply of vitamins A, B1 and C and essential fatty acids as well as important minerals such as iron, potassium, calcium, magnesium, zinc and selenium. Research into the use of garlic for health purposes is still ongoing. However, studies and clinical trials that have been conducted so far confirm what the ancients already knew - garlic is chock-full of health benefits.